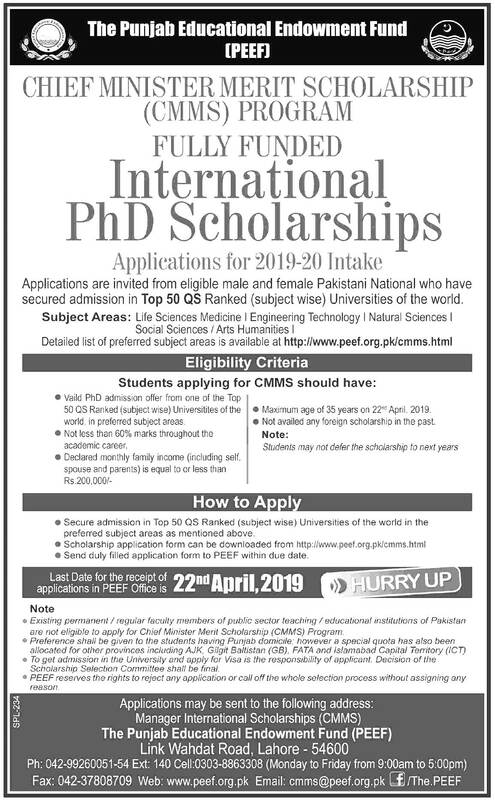 CMMS Chief Minister Merit Scholarship Program 2019-20 has been announced by the Punjab govt, So they invites the application forms for the PEEF Chief Minister Merit Scholarship Program from the candidates who are eligible and interested to avail the scholarship. So you are advised by us that You must read the eligibility Criteria carefully and if you are fulfilling the eligibility Criteria then you must apply within due dates because if your are not apply within due dates and will apply after the due date then your application form will not be entertained. So were providing your details about the How to Apply Eligibility Criteria at this page below. Applications for 2019-20 Intake Applications are invited from eligible male and female Pakistani National who have secured admission in Top 50 QS Ranked (subject wise) Universities of the world. Subject Areas: Life Sciences Medicine I Engineering Technology I Natural Sciences I Social Sciences / Arts Humanities. Detailed list of preferred subject areas is available at this page you can get the complete details online at this page. Maximum age of 35 years on 22th April. 2019. Valid PhD admission offer from one of the Top 50 QS Ranked (subject wise) Universities of the in preferred subject areas. Secure admission in Top 50 QS Ranked (subject wise) Universities of the world in the preferred subject areas as mentioned above. Scholarship application form can be downloaded from this page because we will update the application form here online. You must verify that all the steps you have done because all the steps are very necessary to be able to get the scholarship. All the steps are mentioned below. Copy of valid admission offer for PhD for fall 2019 intake. Attested copies of all educational testimonials. Copy of Synopsis/ Research Proposal. Income affidavit on legal paper (Sample attached with application form). Copy of last paid utility bills (Electricity, gas, phone). Copy of previous months’ pay slips (Self/ parents/ guardian if applicable). Three passport size photographs (Blue background). Any other supporting document required to substantiate the facts given in the application form. For the Further details regarding the CMMS Chief Minister Merit Scholarship Program 2019-20 You must stay with us because we will update here latest information time to time.